New Affiliate Program Pays 70% Per Sale!!! This new affiliate program pays 70% for every sale that you make. "How would you like to earn 3000$ or more a month with passive income"? I would hope you would!! (My new affiliate program is offering all affiliates 70% commission per sale and it is free to join of course). This affiliate program is for an ebook that shows college students how to pay off their student loans!!! "The student college debt now is more than the US national debt". Go over to www.gumroad.com and sign up for free. (You must use a PayPal email address though. I'll then send you your affiliate link and an image to use in your campaigns, also some articles as well. Then you set up a sales campaign and whenever some buys something from it. Gumroad will deposit money into your paypal account!! And that's an outline for you. If you have any other questions at all. Just let me say this to you guys. It would really be sad if you miss out on this opportunity to create some steady passive income every month. 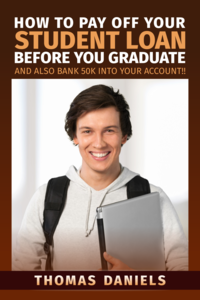 This is an ebook that shows college students how to pay off their student loans faster than they could ever believe! Signed Up Please send me Affiliate details. Go to gumroad.com and sign up for free with a paypal email address, I'll then send you your affiliate link okay? where to get affiliate details? Gumroad said you haven't signed up yet. Signed up with Gumroad. Could you pl. send me the affilate link? My Gumraod registered email address is pramuktha1 @ gmail.com (remove spaces please...) I really want to promote this product. Please reply fast. Just tried to, you didn't sign up, try again please. Okay, you are in, start making money!! Thank you sir. Could you also send me 2D & 3D image of the book which I want to use in my campaign? Okay sending to your email now. Shaun, what email address did you use?